Ohmmmmmmm.......deep breath in through nose out through mouth.........I'm trying to relax after the super hectic Christmas we had! I'm so glad that it's over!! I have been so exhausted with all the shopping and preparing and nerves!! Nerves you ask???? Yes nerves!! I sang the Sunday before Christmas in Sacrament meeting at church. Sacrament meeting, for all of you that are not LDS, is our worship service. Anyway, I sang Angels We Have Heard on High. You know the one with the super long Glorias!!! I was so nervous I was shaking...HARD!!! I just knew everyone could see me shaking!! You would think that after all these years of singing in church that I wouldn't get nervous, but it has been a very long time since the last time I sang, so I was a wreck!! Oh and to top all the festivities off.........I had a staph infection in my leg!! Wonderful, huh??? That hasn't completely healed yet either! I really should go back to the doctor, but I hate to go! I don't enjoy seeing the doctor....AT ALL!! When I went in the first time for my leg, the nurse pulled out a scalpel, some lidocaine and a shot needle........I got teary eyed!!! Seriously....what adult cries at the doctor's office?????? Me apparently! I'm such a chicken! Alright, enough about my life! I have some fun things I've made that I want to share!! This Christmas card was made for my in-laws. I made it in about 10 minutes......I totally forgot to make one, so I threw it together right before we left. That's why there's not many embellishments on it!!! I used basic grey....either figgy pudding or fruitcake paper, I can't remember which one, rose red and chocolate chip cardstock from Stampin Up, and I used the stickers from the Basic Grey figgy pudding or fruitcake paper collection. I also added three half pearls from the pretties kit......Thank you Elisabeth for the gift!!! Oh and the Christmas stamp is a $1 stamp from Michaels. 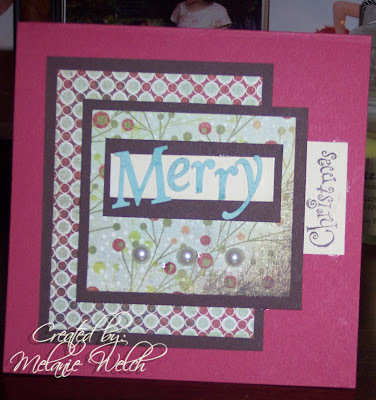 This next card was also made with either the figgy pudding or fruitcake paper. 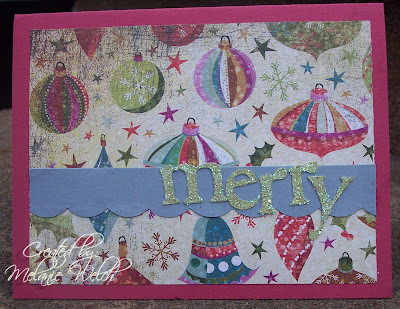 The word merry was cut out of certainly celery cardstock with the cricut, then coated in dazzling diamonds glitter. Other cardstock colors are bashful blue and rose red. This was a super fast card. This sign was made for my in-laws. 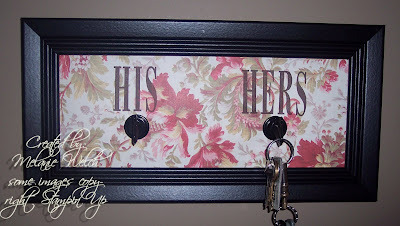 I used power tools on this one!!! I routed the edges of the board all by myself!!! I painted it with apple barrel black acrylic paint, then I sanded the edges to distress it some. I cut the words and numbers with the cricut using the basecamp cartridge. I then mod podged it all down. I think it turned out great!! Well, that's it for today!! I hope you enjoyed all the eye candy!! I have some more projects to show you!! So stay tuned for more!!! Nah, Nah, Nah, Nah, Hey, Hey, Hey Goodbye!! Stampin Up put out the new retirement list today. You can go here to check it out! I am happy to say, I only lost 3 sets this time around. But, I'm extremely sad to say that 2 of those are Letterpress Alphabet and Headline Alphabet! I don't plan to get rid of either of them though! I also lost Flaky Friends. That was the very first set I ever bought from Stampin Up! Now, the planning begins! I am thinking I will post a list soon of all the retired sets I'm finally ready to part with. So stay tuned if you would like to get some oldies but goodies!! Copyright 2012 Melanie Welch. All content, including text, photographs, and concept design elements are © Melanie Welch. Content within this blog is shared for personal, non-commercial use and inspiration only and shall not be used for personal gain or entry into contests or for publication. That wouldn’t be very nice anyway! Thanks!